Obituary for Rebecca J. 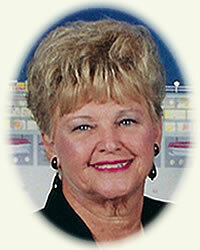 "Betty" Croisdale | Rhoney Funeral Home, Inc.
Rebecca J. "Betty" Croisdale, a longtime resident of Wilson, NY, passed away at home under the care of Niagara Hospice and surrounded by her loving family on Friday, November 23, 2018. She was born in Niagara Falls, NY on January 3, 1929 the daughter of the late William and Agnes [Laughlin] Darby. Mrs. Croisdale graduated from Niagara Falls High School. She married her beloved husband of 69 years Clarence E. Croisdale on September 24, 1949. Clarence and Rebecca were inseparable, they worked side by side and truly enjoyed their lives together. She was the owner and President of Croisdale Fabrication and Metal Works located in Niagara Falls for over 35 years where she worked with her husband, son and daughter in the family business. Mrs. Croisdale enjoyed spending time with her family, traveling, boating and cruises. In addition to her husband, she is survived by her loving children Karen A. Gravanti and Mark C. (Cynda) Croisdale, four grandchildren Mark E. (Dawn) Croisdale, Andrew E. (Erin) Croisdale, Jon Michael Gravanti and Gabrielle J. (Carl) Hall, four great grandchildren Keira, Keegan, Sophia and Gavin which she truly enjoyed spending time with. Sadly Rebecca did not get to meet her 5th great grandchild to be born next month. She was the sister of the late William, John and Fredrick Darby. The family would like to thank everyone that took part in Rebecca's care, especially Peggy. Rebecca was very generous to many organizations that she was passionate about. She always supported those that helped others in need, Some of her favorites were St. Jude's, Wounded Warriors and the American Cancer Society. Funeral services will be held on Monday at 10:00 Am at the RHONEY FUNERAL HOME, 901 Cayuga Street, LEWISTON, NY, with the Rev. Matthew Kofahl officiating. Flowers are gratefully declined. Memorials may be made in her name to St. Jude Children's Research or to Niagara Hospice. Entombment in Riverdale Cemetery, Lewiston, NY.